Mustafa Jarrar is known in his village as Abu El Balad, a term in Arabic that literally translates as father of the town. It is used to describe a community elder who can solve feuds and problems between people in the village. Taking after his father, Mustafa is indeed Abu El Balad and his counsel is sought after by almost everyone in Burqin. Since he started working with Canaan Palestine his home has become what his wife, Shafaq, calls an International Center. When people from other countries who are interested in organic olive oil and fair trade initiatives come to visit their village Mustafa and Shafaq offer their hospitality. Mahmoud is one of six children in the Jarrar family who are constantly being impacted by the cultural exchange olive oil trading has created. As youngsters they are not only finding excitement in meeting the world in their home but they are inspired to create more opportunities for their village. Mahmoud is organizing a youth group in the village of Burqin that wants to invite people to historic tours of the Catholic Church of Burqin that is considered the forth oldest church in the world. In that same life-force, Mustafa feels that Canaan Palestine came at a crucial time in the lives of young people who were depressed. As the Burqin coop representative, Mustafa says that hiring young people to work in olive oil presses and encouraging them to work in their land has had a major social impact. 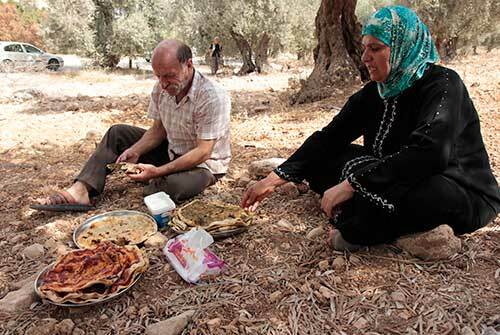 On a personal level he explains that before Canaan Palestine, his eldest son stopped wanting to go to the field and his whole family became disheartened and would only go pick enough olives for the family to eat and they would leave the rest of the crop to waste.